Jordan’s best reputed schools, and is edited by American editors with over 17 years of experience in the field. The series is primarily designed to provide students of the targeted age range, with a positive glimpse into the History, Geography, and Sociology of the Arab World in a modern and easily comprehended manner. 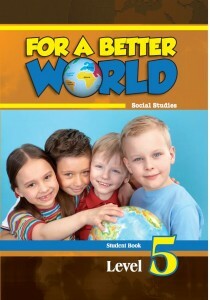 “For a Better World” grows and develops all the way through the six levels of the series. The lower levels of the series build the basic knowledge of the material which progresses smoothly throughout the upper levels. 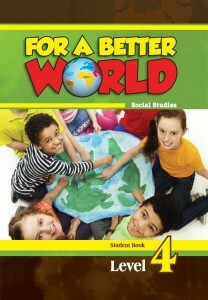 This provides the students with a solid foundation which enables them to comprehend the different elements of social studies. The idea behind the series is based on Arab culture, heritage and tradition; nevertheless, the series is suitable for learners from different nationalities and backgrounds since it does not only focus on the Arab life style but also introduces a range of cultures and different life styles from all over the world. The series introduces a variety of texts based on real life situations that reflect the Arab customs and traditions in a capturing and easy to read way emphasizing the rich history and heritage of the Arab world without overlooking the other civilizations and the different cultures around the world. Since its inception, For a Better World has proven immensely successful, with contracts struck to supply schools in countries like Oman, Bahrain, Lebanon, Saudi Arabia, Emirates and of course Jordan. – Hard cover student textbook with robust construction. 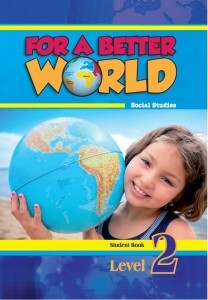 – Teacher’s edition workbook. (for each 25 student books). – The material of the textbook covers the major issues which fulfill the child’s needs and widen his horizons regarding his interaction with the environment. – Each theme is presented in a different color in order to identify the related subjects, and make them more convenient for the students and the teachers. 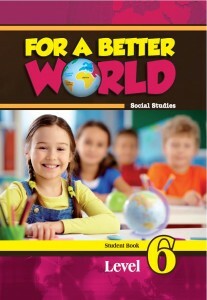 – The keywords of each lesson are highlighted in the textbook. A glossary is attached covering the keywords and some other words chosen from different lessons to enrich the child’s vocabulary. 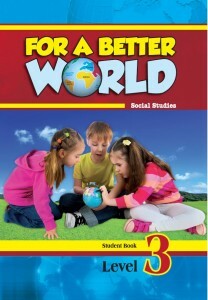 – The textbook is dramatized with lively photographs and drawings, making it more joyful and interesting to the students. The illustrations also help the students understand, comprehend and interact with the different concepts introduced in the textbook. – Throughout the chapters, the child’s understanding of his surroundings is handled. 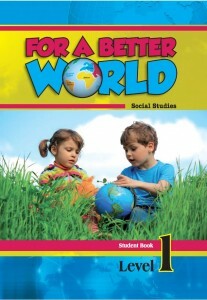 Level 1 begins with the familiar environment and needs of a child as introduced in the first chapter: “All about Me”. – As a step forward, the child is introduced to the meaning of maps, how to read them and tell directions in Chapter 2: “All about Maps”. – Chapter 2 is an introduction that familiarizes the children with maps. The concept of maps will expand in chapter 3, which introduces the globe, the map of the world and the map of the Arab countries. – The child then is introduced to the fact that our world is governed by rules and regulations depicted in the rules that a child follows at home, at school and in the street in Chapter 4: “Rules to Follow”. – Chapter five “People and Places” enables the child to learn more about the world around him: his neighborhood, people living and working in his neighborhood, their professions, as well as naming and clarifying the services offered in some places found in the neighborhood by visiting three locations: the park, the sports center and the children club. – Chapter 6 “Living Together” emphasizes the concept of sharing and how people need each other. It shows how life becomes more worthwhile and how one feels more satisfied when he helps others and is offered help when needed in return. – The workbook is designed to evaluate the students’ comprehension of the lesson and to deepen and emphasize the learned concepts. The level of the exercises in the workbook is suitable for the given material and enjoyable at the same time. – The Teacher’s Notes is designed to help teachers in presenting each theme with more coordination and elaboration in light of the set objectives. It is handy, comprehensive and useful, and to make it more convenient, each subtitles is printed in a different color. – Objectives: specify the concepts that the child must gain out of the lesson. – Instructional technique: provides the teacher with useful techniques. “Motivating Questions” warm the children up and stimulate their thinking, making them feel more involved and interested in the subject. An “Introduction” to the way on how to begin the lesson is included in some lessons. “Activities” are suggested to elaborate and strengthen the child’s understanding of the lesson. Extra information is given in “More to add” when needed. – Integration with other subjects: connects the different concepts the child comes across in the lesson with literature, art, music, drama, math and science in order to deepen these concepts in the child’s mind. – Class/ home projects: these projects emphasize the child’s understanding of the topics. The procedure is fun to perform and easy to demonstrate whether as groups or individuals in the classroom or at home. – Workbook: the workbook is included to assess the child’s comprehension and measure his interaction with the different lessons. It acts as an ongoing assessment along with the suggested projects.